COLOMBO, May 3 2012 (IPS) - Krishnaveni Nakkeeran has fled the country of her birth twice and returned twice in the last two decades. The 36-year-old mother of four from the northern Jaffna peninsula in Sri Lanka first fled the bloody civil war to India when she was just 16 years old in 1990. Her family mistakenly believed it was safe to return five years later and was forced to flee yet again in 1998. She returned again in 2010, barely a year after government forces had defeated the separatist Liberation Tigers of Tamil Eelam (LTTE) in 2009, accompanied by her family. The war may have ended, but a harsh reality awaits those like Nakkeeran, returning after years spent in India. “Life has been hard, very hard, we probably work double (here) what we did in India,” she told IPS. Tens of thousands of Sri Lankans, almost all of them from the minority Tamil community, fled to neighbouring India during the island’s three decades of civil conflict. According to the United Nations High Commission for Refugees (UNHCR), there are over 100,000 Sri Lankan refugees in India, out of which roughly 68,000 live in 112 camps in the southern Indian state of Tamil Nadu. Since the war’s end in May 2009, some of these have begun to return. Last year UNHCR facilitated the return of over 1,700 refugees to the island. This year has seen a drop of around 30 percent in the number of returning citizens; the latest figures released by the U.N. refugee agency said that 408 persons returned during the first quarter of 2012, compared to 597 during the corresponding period in 2011. The UNHCR office in Sri Lanka has attributed the drop to the suspension of a ferry service between South India and Sri Lanka, which had allowed for cheaper passage and the chance to bring back more household material. However, rights groups working with returnees and those still remaining in India speculate that the hard grind awaiting exiles in their old homeland might explain the reduced rate of return. 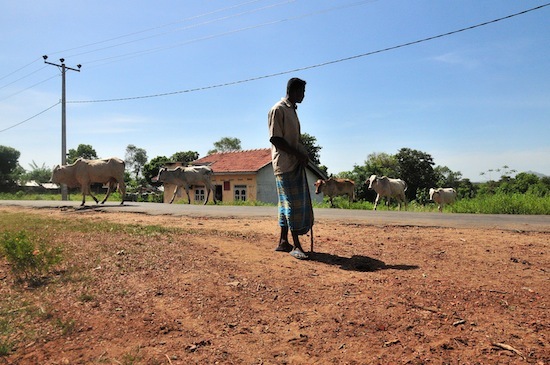 This is especially true of those returning to the Vanni, a vast swath of land in Sri Lanka’s northern province that weathered the worst excesses of the war. “They have to start life all over again. During the years of absence, so much has changed in Sri Lanka that it is a new life in a new country that they come back to,” Sinnathambi Suriyakumari, Sri Lanka’s head of the Organisation for Eelam Refugee Rehabilitation (OfERR), that has worked in India and Sri Lanka since 1983, told IPS. She added that the biggest problem for the returnees is starting from scratch. While there are programmes aimed at assisting internally displaced persons (IDPs) returning to their homes in the former war zone, there is no special programme for those returning from India. “This is where the problem starts, these people feel as if they are returning to an alien land, especially those without extended family here,” Suriyakumari said. UNHCR’s representative in Sri Lanka, Michael Zwack, told IPS that returning refugees lacked proper documentation like identity cards, land deeds and birth certificates that they lost during their flight from the country decades ago. The lack of such documentation is a serious bureaucratic hassle. The returnees, who are given a standard reintegration grant, are faced with multiple other problems that need special attention. “Shelter is another key challenge facing refugees returning to former conflict areas, as they need assistance with carrying out repairs or rebuilding homes that were damaged,” Zwack said. Of the roughly 100,000 houses that were destroyed during the final phase of the war, only 16,000 had been built as of February 2012 according to the latest U.N. figures, which also revealed that reconstruction commitments only extend to the building or repair of 35,000 homes. Meanwhile, the Indian government is expected to commence building 40,000 houses in the region by mid-2012. The displacement of thousands of families, be they IDPs or exiles in India, has created a serious land issue in the Vanni. “Many land owners in the Vanni still find it difficult to claim ownership over their property, and land issues have become a serious problem,” Saroja Sivachandran, head of the Jaffna- based Centre for Women and Development, told IPS. The problem of land and housing is worse for those returning from India, since people who fled as individuals tend to return with families in tow, according to Suriyakumari. Returnees like Nakkeeran are also forced to confront the phenomenon of squatters, people who have lived on others’ land for decades. “We don’t have our land now, we (are forced) to live with someone else on our own land,” she said. Jobs, scarce even among the 434,559 IDPs who are slowly trickling back into the Northern province, is even more pronounced among those who return from overseas. Most of the returning refugees use a 200-dollar UNHCR resettlement grant to make ends meet. “They are free to use the money according to their own priorities to help them restart their lives, for example by purchasing household goods, a bicycle, seeds, or repairing damaged housing,” Zwack said. Despite all the obstacles, many of those who have returned and others planning to make the journey feel they have made the right choice. “It is a land of opportunity and hope for them, that is why they come back,” Suriyakumari said.